Photograph courtesy of the Pennsylvania Historical and Museum Commission. 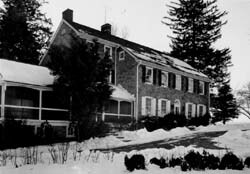 Oakdale was built in 1840 by Isaac and Dinah Mendenhall, two leading abolitionists who helped to form the Society of Progressive Friends at Longwood in 1853 as a result of Kennett Meeting's failure to respond to the abolition cause. Oakdale was the first stop north of the Delaware line on the Underground Railroad, often providing temporary shelter for fugitive southern slaves on their journey north. A distinct feature of Oakdale is a concealed square-shaped room, built in between a walk-in fireplace and the west wall of the carriage house and entered through a loft, that Isaac Mendenhall built for the escaping slaves. John G. Whittier, an antislavery activist, wrote to the Mendenhalls in 1881,"Whenever and wherever the cause of freedom needed aid and countenance you were sure to be found with the noble band of Chester County men and women to whose mental culture, moral stamina, and generous self-sacrifice I can bear emphatic testimony." 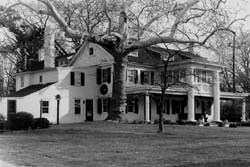 Oakdale is located in Chadds Ford, Pennsylvania on Hillendale Road, just southwest of the town. The property is a private residence and is not open to the public.